Fancy a walk? The one we have in mind is more than 65km long, starts at the foot of Tasmania’s most famous peak, Cradle Mountain, and finishes at Australia’s deepest lake, St Clair. 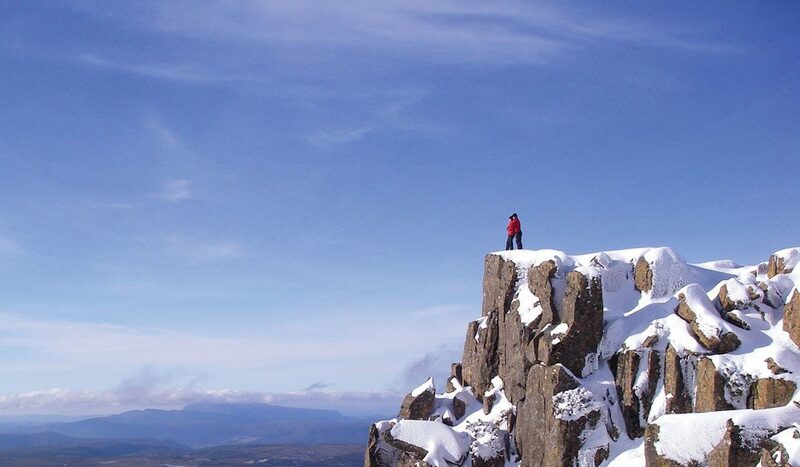 It’s called the Overland Track and it will take you a good week to walk it. On the way, you’ll experience constant views of tall and marvellously shaped dolerite peaks (including Tasmania’s highest, Mount Ossa), beautiful waterfalls, rainforest, scrubland, swamps, bush, alpine plains and rivers. And we haven’t even mentioned the variety of fascinating flora and fauna. The stunning scenery and physical challenges of walking the track have made it famous both here and overseas. So much so that, despite the track taking you through true, rough wilderness, you’ll meet people from all over the planet along the way during the summer. At least once in your life you have to escape to a World Heritage-listed wilderness, and walking the Overland is one of the best ways to do it. You have to make a booking and pay a fee to walk the track. Plus, walkers are required to walk the track in a north-south direction (Cradle Mountain to Lake St Clair) during the walking season. Regular flights are available from all Australian capital cities to Launceston with Jetstar or Virgin Blue, to Devonport with Qantaslink or Rex and to Hobart with Qantas or Virgin Blue. Car rental is available through all major car rental companies in airport or city locations. Cradle Mountain is located in northwestern Tasmania, a 4.5 hours drive from Hobart, 2.5 hours from Launceston and 1.5 hours from Devonport. Tassie Link operates coach services from Devonport and Launceston airports. The “Spirit of Tasmania” sails daily between Melbourne and Devonport. The walking season runs from 1 November to 30 April each year. Even in the summer months be prepared for cold, wet weather.